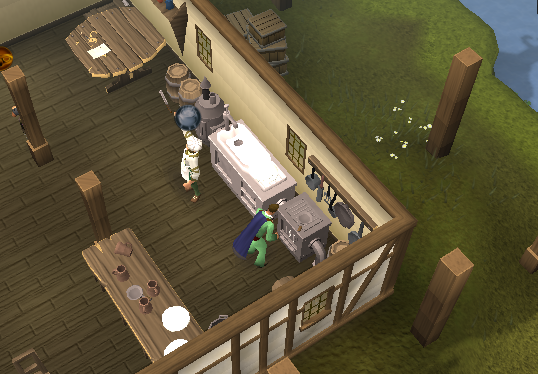 Help Sir Isaac Newton's distant relative Nails Newton feed refugees in Burthorpe! Speak to Nails Newton in west Burthorpe. 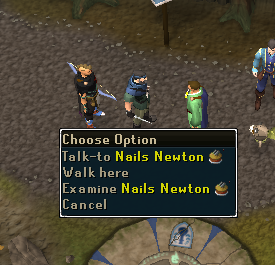 The quest can be started by speaking to Nails Newton, who resides next to the Pick and Lute bar in Western Taverley. Newton says that he needs you to do some "lifting" from a man named Rolo the Stout. Rolo the Stout is a rich merchant and is currently buying up all of the food in Taverly and selling it to the refugees at exorbitant prices. He needs you to get Rolo's personal seal so he can send out a letter releasing all of the food in Rolo's possession to the Burthrope refugees for free. Your character agrees to participate in the plan. Newton says that you will need to incapacitate Rolo the Stout to get his seal as it is kept in a chest in Stout's room. Newton says that Stout eats a pie every day and suggests putting something in the pie that will make Stout sick. Newton tells you to put fishing bait in the pie crust. To do this you're going to need wheat, a pot, and some fishing bait. If you do not have these materials already, head south past the windmill and cross the bridge. 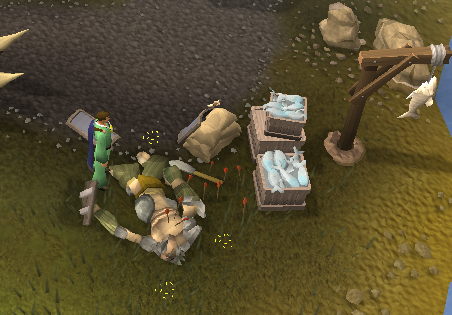 You should arrive at some dead trolls. Pick up some of the fishing bait around them and continue heading south. 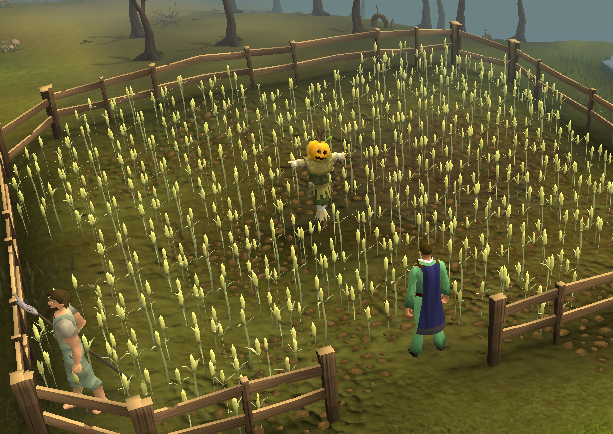 You should come across a wheat field. Pick up the wheat and head back north to the windmill. Take a pot from the table and climb up the stairs. Put your wheat in the hopper and your character should automatically put in the fishing bait as well. Now head back to Nails Newton with your pot of flour. Now Nails wants you to fill the pie with something disgusting. He tells you to catch a raw crayfish, bury it in a field to let it "ripen," and then dig it back up again. 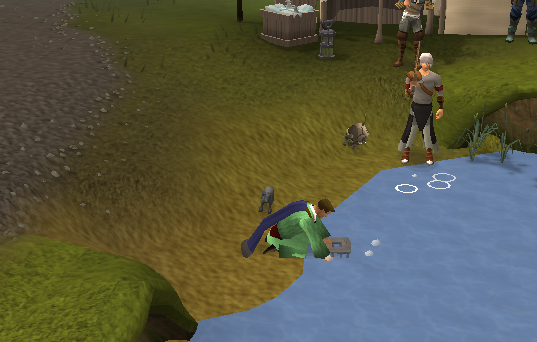 The crayfish can be caught in the pond north of the Pick and Lute bar. The crayfish can be buried in numerous places, but the simplest place to bury it is in the flax field just a few steps west of the fishing spots. Once you enter the field you should see your character bury the crayfish, wait some time, and then dig the crayfish out. Return to Nails Newton with this gross crustacean. Once you have the crayfish Newton states you need one more finishing touch: a raw potato. A raw potato can be obtained by speaking to Head Farmer Jones north of the flax field or by stealing a potato from a vegetable stand in eastern Taverly. 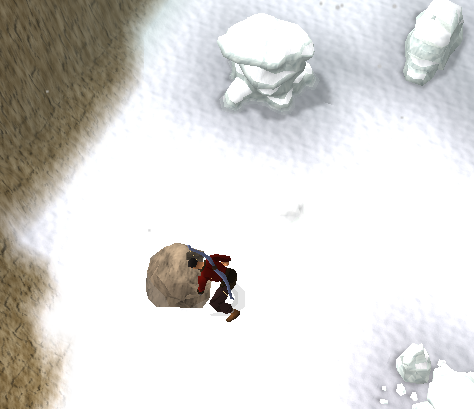 Once you have the potato, head to the snow kebbit hunting area, which is to the west of Farmer Jones' shop. Inspect the kebbit hole and your character should place the potato in and take it out, leaving you with a gross potato. Put the potato into the pie and you will have an uncooked terrible pie. 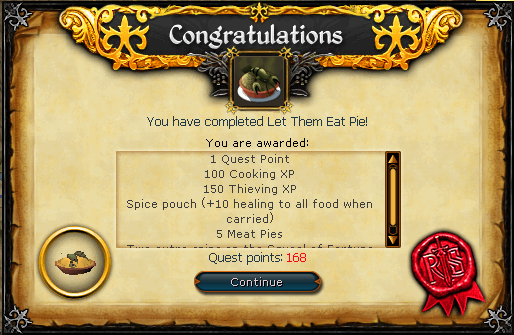 All you need to do now is to cook the pie. Head back to the Pick and Lute bar and use the terrible pie on the range. This will cook the pie. Once you have this pie cooked return to Nails Newton for further instruction. When you return the pie to Newton he will tell you that the stench is so bad that even Rolo the Stout would never eat it. Something must be done to mask the smell. Head south a couple of steps until you see Foppish Pierre, a fancy upper class merchant. Pierre has great spices that should be able to mask the smell of the pie. However he does not like to converse with lower class people such as yourself, so you will have to pickpocket him. Pierre's spices smell so good that he doesn't even realize that you are stealing them from him right in front of his face! Use the spices on the pie and you should be ready to go. 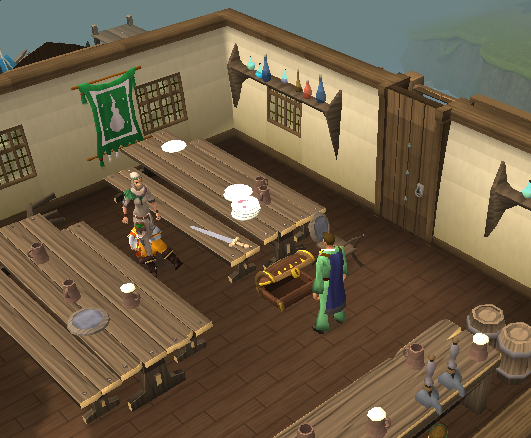 Head back to the Pick and Lute bar and head upstairs. 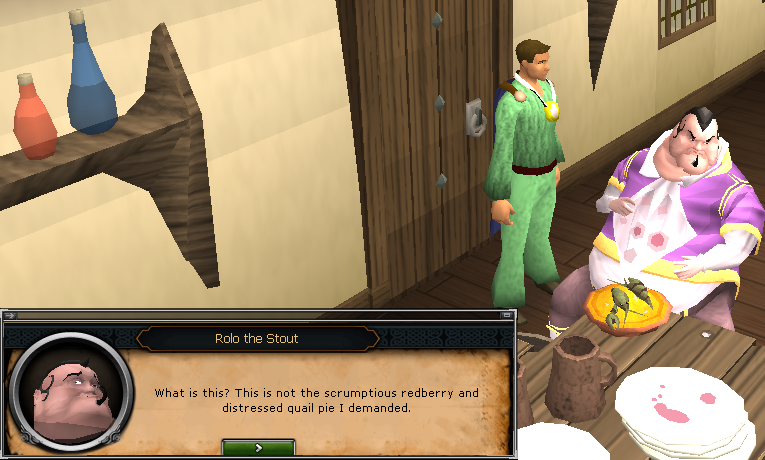 You should see Rolo the Stout. 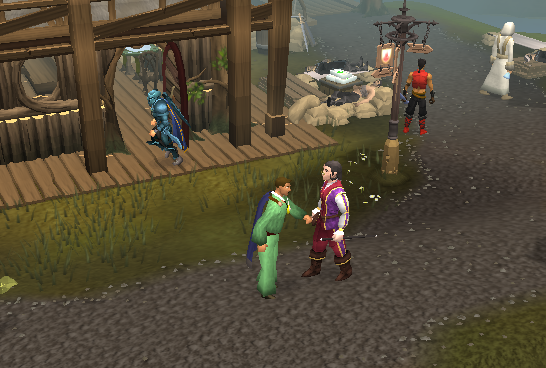 He is the (to put it nicely) the portly man in purple. Talk to Rolo and give him his pie. He will be agitated because this pie isn't the redberry and distressed quail pie he demanded. Your character will tell him that the pie just wasn't delicious enough for his refined tastes so you decided to cook him a better pie. He still is angry, but is tempted to try the pie anyway because it "smells delicious." When he asks what the pie is called any of the possible choices given to you will work. He will then send you away and eat the pie. Shortly after letting him eat the pie he will begin to make gross sounds. At this point you will be asked if you want to hear the rest of the sound effects or not. Be a man and listen to the projectile vomiting! Following that sequence, Rolo will be carted away and you will find yourself with Nails. Nails will now tell you to take the seal. Run upstairs and open the chest. Head back to Nails with the seal. He will seal the letter and tell you to run to Foppish Pierre to get the letter sent off. Run back south to Pierre and give him the letter. He will buy the forged letter and send out the message. Once you have done this head back to Nails Newton to finish the quest. The Spice Pouch: The Spice Pouch is worn around the neck (like an amulet or necklace) and adds 10 lifepoints to each food carried in your inventory. Besides from that, it provides no other bonuses. If lost or destroyed it can be obtained again from Nails Newton.